Capgras syndrome is a rare disorder in which patients recognize a family member but experience that person as unfamiliar, leading to the conclusion that an impostor is impersonating their loved one. Neuroscientists at Beth Israel Deaconess Medical Center (BIDMC) have mapped the brain injuries — or lesions — that result in delusional misidentification syndromes, rare disorders that leave patients convinced people and places aren’t really as they seem. In a study published in the journal Brain, a team led by Beth Israel neurologist and Harvard Medical School Associate Professor Michael D. Fox reveals the neuroanatomy underlying these syndromes for the first time. “How the brain generates complex symptoms like this has long been a mystery,” said Fox, director of the Laboratory for Brain Network Imaging and Modulation and associate director of the Berenson-Allen Center for Noninvasive Brain Stimulation. Delusional misidentification syndromes are among the most striking and least understood disorders encountered in neurology and psychiatry. First documented nearly a century ago, Capgras syndrome is a rare disorder in which patients recognize a family member but experience that person as unfamiliar, leading to the conclusion that an impostor is impersonating their loved one. Conversely, the Fregoli delusion is the belief that strangers are actually loved ones in disguise. Misidentification delusions can also apply to pets and places. 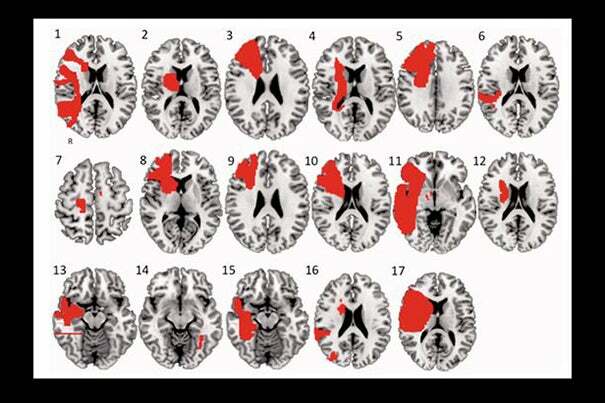 These brain lesions from 17 patients with delusional misidentification syndromes were manually traced onto a common brain atlas. Using a lesion network mapping technique they had developed, the study authors determined that the lesions were connected to an area of the brain thought to be involved in perceiving familiarity. Fox and colleagues, including lead author R. Ryan Darby, the Sidney R. Baer Jr. Foundational Fellow in the Clinical Neurosciences at the Berenson-Allen Center, identified 17 patients with delusional misidentification syndromes and mapped them onto a standardized brain atlas. Then, using the lesion network mapping technique they had recently developed, Darby and colleagues determined that all 17 lesions were functionally connected to an area of the brain called the retrosplenial cortex, which is thought to be involved in perceiving familiarity. Sixteen of the 17 lesions were also connected to a region in the right ventral frontal cortex, which is associated with belief evaluation. The scientists compared the data to 15 control brain injuries that led to delusions other than misidentification delusions. The scientists noted that their network mapping technique does not involve functional neuroimaging (fMRI). Rather, data from normal patients determine which regions of the brain are normally connected to the mapped lesion locations. While this methodology carries several advantages, it does not prove these two regions are dysfunctional in delusional patients following the lesion. Doing so would require recruiting a large number of patients with the rare disorder to a follow-up study, noted Darby. However, the new information gleaned from the research may help patients’ families cope with a loved one’s misidentification delusions — which can disappear as mysteriously as they emerged. Co-authors included Simon Laganiere and Alvaro Pascual-Leone of the Berenson-Allen Center for Noninvasive Brain Stimulation, and Sashank Prasad of the Department of Neurology at Brigham and Women’s Hospital. Actinic keratosis lesions (top image), the yellowish patches, were treated with a combination of calcipotriol plus fluorouracil. Within eight weeks they had largely disappeared (below).